In our introduction to the theory of transistor operation wc showed a bias circuit (Figure 4…4..) in which the base was treated as the ground, or “common” point of the circuit. In other words all voltages (collector-to-base and emitter-to-base) were referenced to the base. This bios arrangement results in what is called the base (CB) configuration for the transistor. 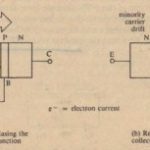 It represents only one of three possible ways to arrange the external circuit to achieve a forward-biased base-to-emitter junction and & reverse-biased collector-to-base junction since anyone of the three terminals can be made the common point. We will study the other two configurations in later discussions. The significance of having a common point in a transistor circuit is that it gives (1″ _ _ ‘\7– us a single re ere nee for both the input voltage to the transistor and the output V-Vll4>~ .voltage. In the CB configuration, the emitter-base voltage is regarded as the input voltage and the collector-base voltage is regarded as the output voltage, See Figure 4-9. For an NgN ! [ansistor, VBE is positive and for a PNP transistor. VfB is positive. Similarly, VeB is a positive output voltage for an NPN and VBe is positive for a PNP. Emitter current is input current and collector current is output current. Our objective now is to learn how the input and output voltages and the input and output currents arc related to each other in a cn configuration. Toward that end, we will develop sets of characteristic curves called input characteristics and output characteristics. The.Input characteristics show t:….relation between input current and input voltage fgr different oalues of output voltage, and the aUfput charactefistics show the relation between output current ~md output voltage fur difterellt values of input current. As these statements suggest, there is in a transistor a certain feedback (the output voltage) that affects the input, and a certain “feedforward” (the input current) that affects the output. 2. Repeat if I( 1.987 mA when Vec is replaced by a short circuit to ground. 1. In Figure 4-11, we see that VHF. = 0.7 V. From Figure 4-10, the vertical line corresponding to VIJE = 0.7 V intersect,s the VCIJ = 25 V curve at l« = 9.0 mA. Therefore, 0′ “‘” leI h = (8.94 mA)/(9.0 mA) = 0.9933. .
2. When Vcc is replaced by n short circuit, we have VCII = O. From Figure 4-10, ‘” = 2 mA at VU1 = 0 V and VIII’: = D.7 V. Therefore, (V “‘” 1(11r = (I.l)X7 ml\)1 (2.0 mA) ,= O.l)!).,). consider now an experiment in which the collector (output) current is measured as V, /I (the output voltage) is adjusted for fixed settings of the emitter (input) current. Figure 4-12 shows a schematic diagram and a procedure that could be used to conduct such an experiment on an NPN transistor. Understand that Figure 4-12 docs not represent a practical circuit that could be used Ior any purpose other than investigating transistor characteristics. Practical transistor circuits contain resistors and have input and output voltages that arc different from the de bias voltages. However. ::i this point in our study of transistor theory we are interested in the transisi-i, itself. We are using characteristic curves to gain insights to how the \'(\I:~.l!,es and currents relate to each other in the device, rather than in the external circuit. Once we have gleaned nil the device information we can from studying characteristic curves, we will have a solid understanding of what a transistor . really is and can proceed to study practical circuits. When lc is plotted versus VCB for differe»: values of Ir., we obtain the family of curves shown in Figure 4-13: the outpu, characteristics for the CB configuration. A close examination of these curves will reveal some new facts about transistor behavior. to enter the collector region until the reverse-biasing voltage Vell is allowed to reach a value large enough to propel all carriers across the junction. When Vca is nr gative, the junction is actually forward biased, and minority carrier flow is inhibited. The proportion of the carriers that are swept across the junction (ex) depends directly on the value of VCR until VCll no longer forward biases the junction. The portion ofthe plot wtiere Vcs is negative is called the saturation region of the transistor. By definition (no matter what the. transistor configuration), a transistor is saturated , when both its collector-to-base junction and emitter-to-base junction are forward biased. a transistor is normally operated (used) in its active region. Note that we can detect a slight rise in the curves as they proceed to the right through the active region. Each curve of constant 1/.. approaches a horizontal line that intersects the fe-axis at a value equal to h, implying that It: approaches lc, and that a approaches I, for increasing Veu. This we attribute to the increased number of minority carriers swept into the collector, which increases the collector current, a’s the reverse-biasing value of Veu is increased. There is one other region of the output characteristics that deserves comment. Note that the curve corresponding to h = 0 is very close-to the horizontal axis, i.c., to the Ic: = 0 line- When the emitter current is made 0 (by opening the external emitter circuit), no minority carriers arc injected into the base. Under those conditions, the only collector current that flows is the very small leakage current, lceo . as we have previously described (see Figure 4-8). With the scale used to plot the output characteristics in Figure 4-13, a horizontal line corresponding to Ie = low coincides with the Ie = 0 line, for all practical purposes. The region of the output characteristics lying below the h = 0 line is called the cutoff region, because the collector current is essentially 0 (cut off) there. A transistor is defined to he cut off when both the collcctor–base ami emitter-base junctions are reverse biased. Except for special digital circuits, a transistor is not normally operated in its cutoff region. A certain NPN transistor has the CB input characteristics shown in Figure 4-10 and the CB output characteristics shown in Figure 4-13. I. Find its collector current when Veil == \0 V and VIII: == 0.7 V.
2. Repeat when Veil == 5 V and h == 5.5 mA. 1. From Figure 4-10, we find h == 4 mA at VHf = 0.7 V and VC/J = 10 V. In Figure 4-1}, the vertical line Veil == 10 V intersects the I,: == 4 mA curve at approximately I( == 3.R5 mA. The collector current under these conditions is therefore 3.85 mA. 2. The condition~ given require that we interpolate the output characteristics along the vertical line Veil = 5 V, between le = 5 mA and ft.’ = 6 mA. The value of Ie that is halfway between the IE = 5 mA and It: = 6 mA curves is approximately 5.4 mA. Note that high accuracy is not possible when using characteristic curves in this way. In most practical situations, we could simply assume that lc = It: = 5.5 mA without seriously affecting the accuracy of other computations.